As soon as I pulled this shirt out of its parcel my mother freaked out, yes it is a bit different/on the dark side and some of you may not like it but oh well. I haven’t worn it out yet as I have only been wearing girly dresses for the past two months. 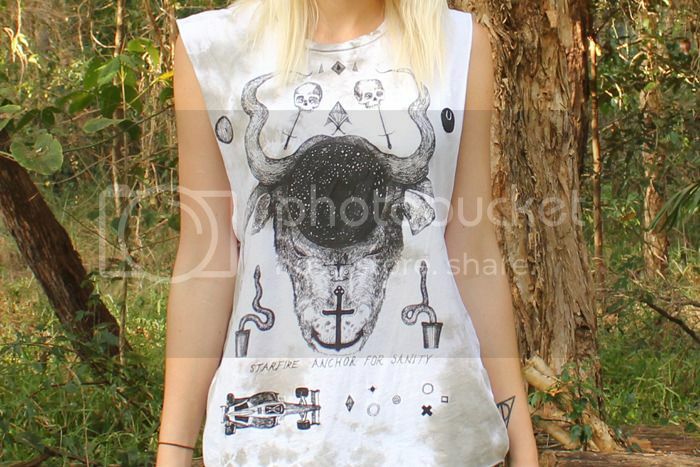 I got it from the Urban Outfitters online store along with a demonbabies shirt and the cut out dress from this post. 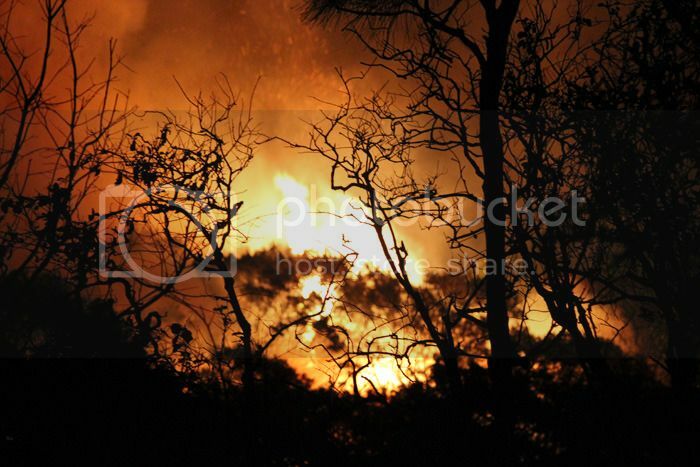 There has been a lot of bushfires around my town lately and my friend and I happened to drive past one right at its peak and we had our cameras with us so we took pictures. We trecked through the bush a bit to get a better view and later that night I drove past farmland that was also on fire. I have no words, I love it too much! Oooh, what a cool tank! That tank is super fun! I hope the wildfires are dying down! Cool top! And great photos too, hope everyone down there is okay! Oh wow, the fires are a shame, although they do make for beautiful pictures...you're gorgeous. I love your top. oh wow, i love the design on the top you are wearing. i hope the fires are not as crazy anymore dear! thank you for the comment about my cape- i love your tee! its a little edgy-ier than your norm buty looks great on you! hope your ok with the bush fires- they seem so servere to me! I have never seen a bushfire before, so looking at your photos was really fascinating!How lucky that you had your camera on hand! I love your blog and your style, everything about you is so perfect! The tank is super fun... Thanks for sharing the photos, hope the fire isn't as crazy anymore, and everyone is ok! I have only seen bushfires on the news. I hope everyone will be safe and that the bushfires are not as crazy anymore! Love that top, great pictures btw! j'adore ton t-shirt .I love your t-shirt ! I love so much your top! Amazing photos!!! I love your blondy hair! Great top :D like your outfit! this is a super great transformation from wearing dresses! Lovely photos! The fire is a tad scary, huh? I am totally in love with the shirt! From where did u get it? ?